A solid technical grounding and a passion for computer science. This is the calling card of the profession of Big Data Architect. Big Data Engineer: Monica Franceschini is responsible for the Big Data group in Engineering’s Data and Analytics Competence Center, an across-the-board structure which operates in the world of data.“If I were to describe the kind of work I do – she says – I would say that I deal with designing complex distributed architectures, required to analyze data and to extract information value, including through technology scouting, useful for identifying solid solutions”. 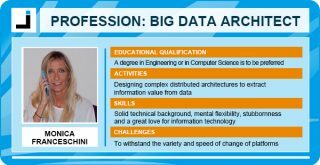 Her work is very technical, so much so that several times Monica Franceschini reiterates the necessity of “a solid grounding in computer science or computer engineering” in order to become a Big Data Architect. In Monica’s work group most of the professionals took the same course of studies. “This is a coveted profession, but it requires a very high level of technical competence, particularly because there is a proliferation of new tools and of different programming paradigms which one needs to know”. What expertise is necessary to become a Big Data Architect? “A solid technical background, as I have already mentioned, and the ability to quickly switch from one topic to another. A dynamism which probably leads women to adapt well to this work, given their aptitude for multitasking and for addressing several problems at once. In addition, certainly stubbornness and a love for computer science and technology as it becomes a constant companion of our days”. How many women are there in your work group? “There is a considerable number of women engineers in the team, about 50%. A greater number works as Big Data Scientists, but we can say that there is a good gender balance in the company which leads us to work very well. We could say that women pay particular attention to human relationships and have a greater sensitivity, which is particularly important in groups carrying out technical work”. What kind of complexities do you have to face in this profession? “Those who approach the job of Big Data Architect need to know that one does not become an IT architect overnight: generally speaking you start off as a developer, to gain the right experience to carry out rather complex work. Complex especially because of the high transience of the solutions which leads to never being able to declare oneself an expert in a certain technology. It is very unlikely that we should specialize in one thing to then use it for different issues. We know, we must know, many solutions and we need to keep constantly up-to-date”. A profession that leaves no space for leisure then? “Personally, I can say that I am the mother of two children, so I am proof that being a Big Data Architect allows balancing things, despite this being a non-trivial job. Although it is true that I often find I have to study in my free time, but that’s part of the job. I think that allowing just a few weeks to go by without reading or keeping up-to-date is all that is needed to miss out on many of the things required to best perform your work”. A book which left its mark? “One of the last ones I read which provided interesting food for thought was Die dunkle Seite, by Frank Schätzing. A thriller set at the time of the Gulf War that makes us investigate the issue of falsifying reality and of our partial view of reality as drawn by the media. If we think it over, particularly because of social media, reality is increasingly media-based and this bulimia of information does not leave us the time to examine things in depth and to understand them. We all know a great deal, but not in depth. A non-trivial problem which, I hazard a hypothesis, will only be resolved by a genetic evolution that will help us to change our attitude, when digital appendices will have become a “sixth sense” with which human beings will be able to assess credibility, or not”. How does a Big Data Architect keep up-to-date? “Personally I prefer newsletters which aggregate useful news to social media like Twitter, where I no longer find reliable and interesting technical references. One of these is certainly Data Eng Weekly where I always find interesting solutions to study and test. Some unmissable annual events such as the Strata Data Conference or the DataWorks Summit, which I have the privilege of taking part in this year as a speaker to present a project of ours, also offer important learning opportunities”. “Studying and experimenting with solutions”.